Recording, geophysical survey and a watching brief undertaken at Pill Priory, a Tironian house founded near Milford Haven in the late 12th century, has considerably increased our knowledge of a little understood site. 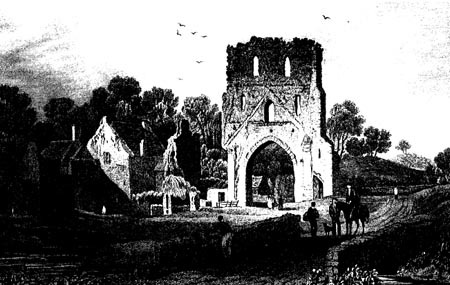 Although the priory, a daughter house of St Dogmaels Abbey, appears to have been of moderate size it nevertheless had a fully-developed conventual plan, based around a cruciform church. Only the chancel arch and part of the south transept now survive; however, the north transept north wall was revealed during sewage-pipe excavation and the nave and chancel wall-lines, a detached building, possibly an infirmary, have been detected as geophysical anomalies. The conventual buildings were selectively adapted as domestic accommodation through the 16th century - 19th century, but elements of the medieval fabric still survive. The sewage pipe excavation revealed 31 graves, all related to the priory and contained well-preserved human skeletal remains in varying degrees of completeness, but had undergone later disturbance and only one had any evidence of a coffin.